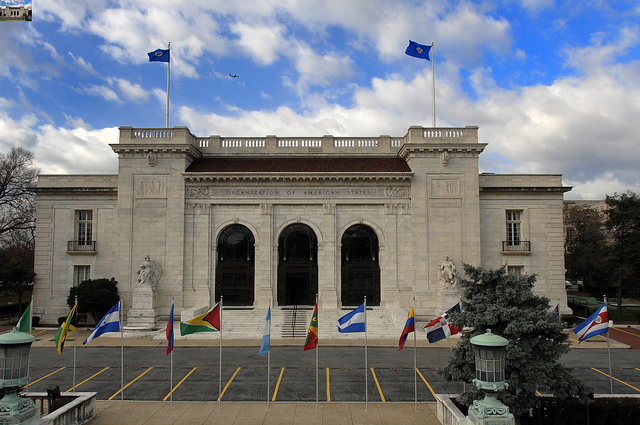 Business and Human Rights: A New Challenge for the OAS? On January 29 of this year, the Permanent Council of the Organization of American States (OAS) held a special session on the Promotion and Protection of Human Rights in Business. This session was the product of OAS General Assembly Resolution 2840 (XLIV-O/14) of June 2014, which acknowledged the value of the United Nations Guiding Principles on Business and Human Rights and the need to promote this issue in the region. At this meeting, the chairman of the Inter-American Juridical Committee presented a report on corporate social responsibility in the area of human rights. Other participants included Alexandra Guáqueta, who was then a member of the United Nations Working Group on Business and Human Rights; Daniel Taillant, Director of the Center for Human Rights and Environment in Argentina; and Eduardo García, Director of Corporate Responsibility for the Multinational Corporation REPSOL, as well as other OAS officials. Although for many the topic was new, it was not for the political bodies of the OAS, which had been addressing the issue mainly through General Assembly (GA) resolutions with recommendations to the States and from the perspective of corporate social responsibility. In fact, in numerous resolutions passed over the last decade, the GA has expressed the need for States to continue discussing and analyzing the issue of corporate social responsibility, and recommended that they learn about and exchange experiences and draw on the work done by other actors in the field, such as multilateral organizations, international financial institutions, civil society organizations, and the private sector for information. In addition to the treatment of this issue by the OAS’s political bodies, in recent years the Inter-American Commission on Human Rights (IACHR) and the Inter-American Court of Human Rights (Inter-American Court) have developed a body of standards and recommendations for the States on matters in which corporations play a significant role. Specifically, both bodies have addressed the impact of natural resource extraction on human rights in general and on the rights of indigenous and tribal peoples in particular. Both bodies have done especially important work to give content to the right to prior consultation enjoyed by indigenous and tribal peoples. It is no exaggeration to say that the Inter-American Human Rights System (IAHRS) is the supranational rights system that has produced the most, and the most specific, standards to protect that right. During the past decade, private investment in the extraction of natural resources has increased significantly in Latin America. Its positive and negative effects are beyond the scope of this article. Nevertheless, one fundamental point bears mentioning: as the region experienced significant economic growth, so have social conflicts also intensified. A good analysis of this phenomenon can be derived from the data published by the National Ombudsman in Peru in its monthly report on social conflicts, which serves as a barometer for the type and number of social and governability conflicts in that country. According to this source, in March 2015 alone, 155 active conflicts, 56 latent conflicts, and 179 collective protest actions were reported. Some 60 to 70 per cent of these were socio-environmental conflicts. The excellent monitoring by the Peruvian Ombudsman provides hard data confirming a reality that has been emerging to varying degree throughout the hemisphere. This social unrest has come with a new dynamic: it is not merely a matter of States disregarding the rights of citizens, but rather of States allowing third parties (corporations, in many cases foreign) to operate within their borders in disregard of the rights of citizens. The IACHR’s treatment of this subject also gives an indication of the magnitude of the phenomenon. Since 2004, there have been several thematic hearings that have, from different angles, addressed the conflict between the rights of indigenous peoples and the interests of the industries involved in the natural resource extraction. Hearings have been held on, among other issues, The Situation of Indigenous Peoples in Relation to Extractive Industries (March 2004); Human Rights and Global Warming (March 2007); Situation of Persons Affected by Extractive Mining and Petroleum Industries in Ecuador (March 2007); Right to Consultation of the Indigenous Peoples of the Amazon Region and Implementation of Projects of the Initiative for the Integration of the Regional Infrastructure in South America (IIRSA) (March 2010); Human Rights Situation of Persons Affected by Mining in the Americas and the Responsibility of Host States and Home States of Mining Companies (November 2013); and Extractive Industries and Human Rights of the Mapuche people in Chile (March 2015). Other IACHR activities, such as its thematic and country reports, have also shone a spotlight on this issue. As a complement to the IACHR’s important 2009 report entitled Indigenous and Tribal Peoples’ Rights over their Ancestral Lands and Natural Resources, a new report is expected at the end of 2015 on violations of the human rights of indigenous and Afro-descendant peoples in the context of extractive and tourism-related projects. Beyond the issues concerning indigenous peoples, the IACHR has addressed the impact of business activities on human rights by bringing attention to other complex situations in its thematic hearings, such as the destruction of Mexico’s biocultural heritage through mega-development projects or the potential negative human rights effects of building the transoceanic canal in Nicaragua. To date, the focus and the object of claims within the IAHRS have mainly been the State or States in which these acts take place. Nevertheless, the growing role and strength of corporations demands more creative strategies. Current discussions in the United Nations, such as those on national action plans on business and human rights or the possible adoption of a binding treaty to establish obligations for corporations, are significant steps in that direction, but are not the only ones needed. In that respect, both the IACHR and the Inter-American Court must continue to advance this discussion. The future creation of the special rapporteurship on Economic, Social and Cultural Rights will be a crucial point along this path. We hope that, within the framework of its mandate, the IAHRS will begin to tackle new issues and challenges—already being discussed in other forums—such as the responsibility of the corporations’ home States. In particular, the issue of extraterritoriality has a history before the IACHR. At its 149th session (2013), a thematic hearing addressed the human rights of persons affected by mining company activities, and the need to consider the possible responsibility of home States. Later, at the 153rd session (2014), one hearing addressed the responsibility of Canada for human rights violations committed by its mining companies in Latin America, as well as the inadequacy of dealing with this issue through voluntary principles derived from corporate social responsibility policies. Finally, at the latest session (154th session, in 2015), two hearings again underscored the need to consider the responsibility of corporations’ home States. This provision shows that a normative framework exists, and that for it to be effective, more robust and coordinated measures must be taken by OAS bodies. The special session of the Permanent Council in January 2015 was an important step. In addition, we hope that the creation of an Inter-American System for the Prevention of Social Conflicts, announced by recently elected Secretary-General Luis Almagro, will provide the opportunity to utilize and value the standards that have already been developed within the OAS, and that the actions taken will be consistent with what is being done at the inter-American level with respect to human rights. In this regard, it bears stressing that although prevention and dialogue are important, compliance with international human rights standards is as well. At DPLF and other civil society organizations, we are excited to see that these discussions have finally arrived before the IAHRS. Focusing on this issue and seeking effective ways to enforce the human rights of groups affected by corporations engaged in extracting natural resources is one of the main challenges of the 21st century. We will be paying close attention to the OAS’s next steps in this area. A similar meeting was held hours earlier, sponsored by a coalition of civil society organizations promoting business and human rights issues. It was also attended by members of the Inter-American Commission on Human Rights and regional civil society representatives. See, e.g., IACHR. Indigenous and Tribal Peoples’ Rights over their Ancestral Lands and Natural Resources: Norms and Jurisprudence of the Inter-American Human Rights System. OEA/Ser.L/V/II.Doc.56/09, December 30, 2009. For more information, see Salazar, K. and Galvis, M.C. (2013). Derechos Humanos y desarrollo económico: ¿cómo armonizarlos? Anuario de Derechos Humanos. Santiago: Centro de Derechos Humanos, Facultad de Derecho Universidad de Chile, p. 196. See Salazar and Galvis, op.cit., p. 197. IACHR. Complaints regarding the destruction of Mexico’s biocultural heritage due to the construction of mega development projects in Mexico. Thematic hearing. 153rd session, October 30, 2014; IACHR. Construction of the transoceanic canal and its impact on human rights in Nicaragua. Thematic hearing. 154th session, March 16, 2015. IACHR. Human Rights Situation of Persons Affected by Mining in the Americas and the Responsibility of Host States and Home States of Mining Companies. Thematic hearing. 149th session, November 1, 2013. IACHR. Impact of Canadian Mining Companies on Human Rights in Latin America. Thematic hearing. 153rd session, October 28, 2014. IACHR. Business, Human Rights, and Prior Consultation in the Americas. Thematic hearing. 154th session, March 17, 2015; Human Rights and Extractive Industries in Latin America. Thematic hearing. 154th session, March 19, 2015.